Typically, the education sector is slow to make a significant change. However, the benefits of technology are too substantial, and it is the catalyst driving change. Internet connectivity and technological innovations touch every aspect of our lives daily, and these same digital advancements are transforming education. Educational institutions need to remain competitive in this dynamic environment, and higher education is projected to continue to invest in technology to support student success. 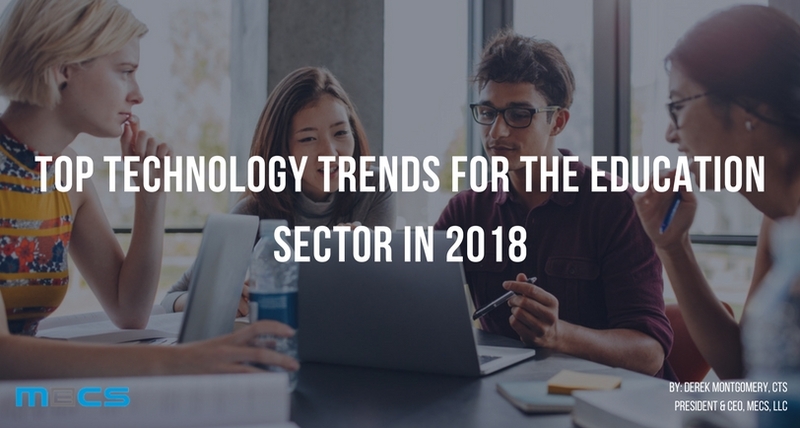 The top technology trends for the education sector in 2018 will provide a more flexible, assessable and customized approach to education. Mobile Learning is revolutionizing education through greater accessibility and flexibility. We are all attached to our mobile smartphones, and this gives us 24/7 access to mobile networks. Education has leveraged this technology to provide students the ability to learn anytime from anywhere. Cloud-based Technology provides a digital learning experience regardless of the geographic location of the students and faculty. Schools have access via the cloud to an enterprise infrastructure while saving them time and money. It aids in connecting students and faculty in the online environment, and it offers a centralized repository for course information that can be used independently or shared during interactive collaboration sessions. Big Data and Data Analytics lead to improved teaching methodologies. Analysis of existing data on student engagement and their overall experience can be extracted to improve courses and lead to increased student success. Machine Learning and Artificial Intelligence benefit students with a personalized learning experience. Machine Learning (ML) can access, compile and analyze volumes of data available on the internet and in public and private databases. Professors can use the machine learning to continuously maintain courses with new up-to-date course resources. Artificial Intelligence (AI) can maximize the time of human advisors and tutors while also customizing the information for the student. AI chatbots can interact with students to provide many services such as career information, help with resumes, job placement, skills requirements, company information, and the list is endless. This same technology can be used to motivate students, and it also can provide tutoring services if a student gets stuck and needs additional learning experiences to master a competency within a course. Of course, human advisors can help individual students who need more unique services. Gamification, Augmented Reality, and Virtual Reality increase student’s engagement and concept retention rate. When students sit passively in the classroom listening to a lecture, their concept retention is only 30%. But when the student gets a chance to for experiential learning in the augmented or virtual reality environment, the concept retention rate surge to 90%. The benefits of adopting these IT trends in education are substantial. Mobile Learning is revolutionizing education through greater accessibility and flexibility. Cloud-based Technology provides a digital learning experience regardless of the geographic location of the students and faculty. Big Data and Data Analytics lead to improved teaching methodologies. Machine Learning and Artificial Intelligence benefit students with a personalized learning experience. Gamification, Augmented Reality, and Virtual Reality increase student engagement and concept retention rate. These educational trends provide maximum flexibility, efficiency and direct benefits to students’ careers. The skills students learn in the classroom will help them succeed in the global world where technology is continually driving change. Implementing these technology initiatives can be complicated, and a wrong decision can be expensive. Why not partner with a well-respected MSP partner that has expertise in the education industry. MECS is a full-service technology company that helps educational institutions leverage technology to grow and meet their objectives.